Dorothy Geddes had a distinguished professional career. 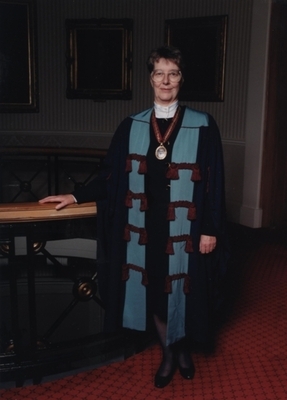 She specialised in Oral Surgery and in 1963 became the first female to be awarded the Fellowship in Dental Surgery of the Royal College of Surgeons of Edinburgh. After working in Birmingham, she made a career change and moved to Rochester, New York, to the Eastman Dental Centre. She worked there on dental caries, which eventually lead to the award of the European Organization for Caries Research Rolex prize in 1998. She returned to the UK and took up a lectureship at the University of Glasgow and was awarded a personal chair in 1990, the first female dental academic to do so in the UK. Her skills were recognized within her profession. She became President of the Royal Odonto-Chirugical Society of Scotland, President of the West of Scotland Branch of the British Dental Association, elected Convener of the Dental Council and then Dean of the Faculty of Dental Surgery, again a female 'first'. Final recognition came in the form of an Honorary FRCS, the highest honour that the Royal College of Surgeons can bestow. Obituary. 1998. Journal Royal College of Surgeons of Edinburgh. 43:369-370. World Changing Project, "First female Professor of Dentistry in the UK," in University of Glasgow World Changing (University of Glasgow, 2010); http://www.worldchanging.glasgow.ac.uk/article/?id=51 (accessed April 23, 2019). World Changing Project. "First female Professor of Dentistry in the UK." In University of Glasgow World Changing. University of Glasgow, 2010. http://www.worldchanging.glasgow.ac.uk/article/?id=51 (accessed April 23, 2019). World Changing Project. "First female Professor of Dentistry in the UK." University of Glasgow World Changing. University of Glasgow, 2010. 23 April 2019 <http://www.worldchanging.glasgow.ac.uk/article/?id=51>.